C2C Festival has just got more exciting with the Songwriters and pop up announcements and now the countdown really begins – but with all these amazing artists, who should you be going to see? Well I can’t make that decision for you as every artist is brilliant and well worthy of your time but I have listed a few favourites. We have been featuring Stephanie since we started this site and we just love her. Stephanie released her debut album Love The Way You See Me last year and she has been named one of Rolling Stones artists to watch. Love The Way You See Me was one of our top albums of last year and features her fantastic single Drinking With Dolly which bridges the gap between traditional and modern country and is an amazing uplifting track singing the praises of artists such as Dolly, Loretta and Tammy. Stephanie is the sweetest, she is instantly loveable and her voice and music are sublime with much to adore. Her most recent single Selfish has received great success and praise and to see her perform live is an opportunity not to be missed. Ryan needs to be on your radar. Still Believe In Crazy Love is one of the best songs I have heard in a long time and is a beautiful country rock ballad. Ryan has a very strong and passionate voice that sets the bar pretty high. Ryan is working on a debut album via Warner Music Nashville and we cannot wait. Recently Ryan released a stripped back version CCR song Fortunate Son which is exceptionally good. Ryan will be playing The Late Night Saloon at All Bar One on the Sunday and his set will be worth it. Yes I have been singing her praises for a very long time now but Twinnie really is an artist that needs to be on your list. Twinnie has credits on both of The Shires albums and has recently been signed to BMG. A regular visitor to Nashville, Twinnie is constantly writing music and can boast a high calibre of artist friends such as Lucie Silvas, Brothers Osborne and many more. Twinnie was personally asked by Bryan Adams to join her on stage at last years Cornbury Festival during his headline set. Twinnie has opened up for the likes of Chase Rice, Andy Brown and more and she will be supporting Sarah Darling at her Union Chapel show on March 5th. Twinnie’s career has only just begun so get in on the action early, with her vocal, lyrical, musical talents as well as her infectious personality , Twinnie will soon be making her mark and sky rocketing. I love Danielle, she is such a superstar and a real talent. Winning The Voice USA in 2013 on Team Blake, Danielle released an amazing self titled debut with Big Machine Records which featured her hit singles The Heart Of Dixie and Young in America. Fans of TV’s Nashville may recognise her song Yellin’ From The Rooftop which was sung by character Juliette Barnes. Daughter of A Workin’ Man is a favourite for me and is co – written with fellow C2C guest Nicolle Galyon who will be playing the songwriters show Thursday. Danielle took some time off to return with a more mature, creative sound and released her second album I Don’t Believe We’ve Met last year, again, via Big Machine Records. This album certainly see’s a more mature side to Danielle as well as a softer, more edgy side and Danielle has a huge part in the writing process of this album too. Sway was her debut single from this album which delivered a more up beat, dance-pop sound but the rest of the album is much more toned down and very ballad focused and with a voice like Danielle’s this is far from a bad thing. Danielle is another rarity to the UK and will making not just her C2C debut but her UK debut and having seen her life in Nashville, this lovely young star will blow you away. What can I say about Mo that does him justice? I love this mans music so much. If you love traditional country and artists such as Josh Turner then make sure you catch Mo Pitney. Mo’s album Behind This Guitar is a breath of fresh air with such authenticity and it is so lyrically relatable that it stopped me in my tracks. Mo will be a highlight to this years C2C and being one of very few traditional sounding acts, he is an absolute must-see. 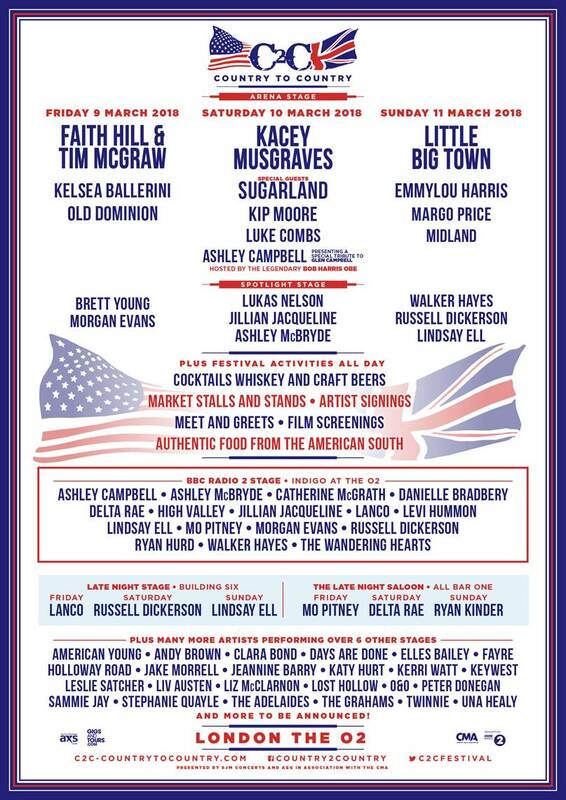 Another Big Machine Label Group act – I love how this label are so committed to bringing their artists to the UK. Delta Rae are a fresh new vocal group with quite the career ahead of them. Their EP A Long and Happy Life has something for everyone. Vocal groups show their talents best in a live setting as recording can never quite capture the true sound of their collective vocals so seeing then is a must. Title track A Long and Happy Life will get you in a good mood with its inspirational anthem like sound, its up beat and feel good vibe and incredible vocal harmonies. Basically everyone on the Radio 2 Stage is worthy of your time and I would be filling pages praising them all. Ryan Hurd was here last year supporting Maren Morris and more than proved his brilliant artistry with a string of successful shows. Ryan rocked the joint and we soon came to realise how he and Maren are country musics new “Power Couple”. Ryan will be part of the Bluebird Sessions alongside Jillian Jacqueline and Mo Pitney. Having written songs such as You Look Good for Lady Antebellum and Last Turn Home for Tim McGraw with his wife to be Maren Morris, Ryan has also proven his worth as an artist. Ryan released his debut EP last year with fantastic singles such as We Do Us and Love In A Bar which Maren Morris is in the video for. I will always be screaming this amazing artists name from the rooftop. Jillian is one of the best things to happen to country pop with her cool retro- country pop sound and style. Jillian has so far only released two songs and an EP but she became my number one artist of 2017. Jillian’s sweet and soulful sound translates even better in a live setting – songs such as God Bless This Mess written with Lori McKenna are wonderfully emotive and her current single Reasons is quirky, fun, addictive and brilliant. Do try to catch Jillian, you will love her. O&O are a new country duo who consist of Colorado-native, multi-instrumentalist and vocalist, Obadiah Jones, and Israeli vocalist, Orian Peled. I have yet to see this duo live but am definitely interested. Their singles Traveling and Some Days are highly impressive and very acoustic driven with great harmonious vocals and a wonderful folk-country hippy edge and C2C fans will no doubt been blown away by this up and coming duo. The Grahams have quite a following in the UK Americana scene. Married couple Alyssa and Doug Graham have released various albums over the years including soundtracks to their own documentaries of their travels across America. The Grahams have a new album due later this year which is produced by Richard Swift (Black Keys, Arcs, Shins), and continuing their adventurous exploration of the USA – this time around on two wheels – the soundtrack to their new feature length documentary Love & Distortion. The Grahams will be a more than interesting duo to watch and they will bring something different, something rootsy and folky combined with Americana that will leave a lasting impression in the best kind of way. TWH have been heavily featured on this site and in a very positive light. UK based Folk-Country vocal group, The Wandering Hearts had a fantastic year in 2017 and 2018 looks to be even bigger. Signed to Decca, Tim, Tara, Chess and AJ will release their debut album Wild Silence February 9th – we have already heard this and it is a game changer. One thing that I will say about the album is as amazing as it is, recordings do not do this band enough justice so you need to catch them live. The way their vocals blend live is insane and they know their craft so well that it is hard to fault them.